When we want to copy a video DVD, we first have to rip the video DVD in its natural format onto our computer, after that we will need a tool that will help us burn the resulting folders onto another optical disc, keeping the same file system, so we can view it using a conventional DVD player. When we have prepared a film to burn it in video DVD format, we will have a couple of folders called "Video_TS" and "Audio_TS" that have the video files inside them, so we can view them later. 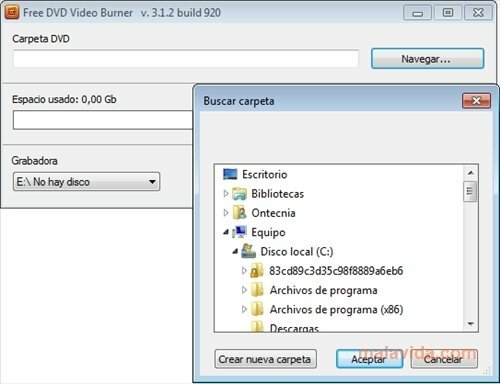 Free DVD Video Burner will help us burn this type of disc, in an easy and simple way, because all we have to do, is select the folders and press the burn button, the program will do the rest of the work. The program is compatible with DVD+/-R, DVD+/-RW, DVD-RAM and dual layer DVDs. Download Free DVD Video Burner and discover the most simple way of converting your ripped DVDs to a physical format.